The new Longitude Prize has nothing to do with longitude: that particular problem is long since solved. Yet it has a Longitude Committee that, like the original Board of Longitude, includes the Astronomer Royal. Lord Rees has borrowed the tercentenary of the first Longitude Act and the idea of an incentive prize in the hope of turning money and talent toward a new challenge. But, apart from the Astronomer Royal, what are the connections between the new committee and the old? And what do the differences tell us about the two schemes? The 1714 Act appointed a number of Commissioners of Longitude, either by name or by position, from political, maritime and scientific worlds. By making several positions ex officio, the authors of the Act ensured – by accident or design – that the Commission could continue in perpetuity. It also marked a first by bringing key scientific positions directly into government decision-making. The political positions were: the Speaker of the House of Commons, the First Commissioner of Trade and, in 1714, ten named Members of Parliament. The maritime and Admiralty representation was: the First Lord of the Admiralty; the First Commissioner of the Navy; the Admirals of the Red, White and Blue Squadrons; and the Master of Trinity House. The scientific men were: the President of the Royal Society; the Astronomer Royal; and the Savilian, Lucasian and Plumian Professors at Oxford and Cambridge Universities. Later the Lowndean Professorship, founded in 1749, was also added. The Commissioners do not seem to have met before 1737, when they deliberated John Harrison’s first reward, by which time many of the named MPs had died. The left the ex officios, the best-known of which attending in 1737 were Edmond Halley and James Bradley. Halley was Astronomer Royal, although he had previously been a Commissioner as Savilian Professor. Bradley was there as Savilian Professor, but was to remain a Commissioner when he succeeded Halley as Astronomer Royal. It was a small world. The Commissioners of Longitude were not known as the Board of Longitude until around the 1760s. By then business was considerably more bureaucratic and regular and the core team had settled down as the Astronomer Royal, President of the Royal Society, the professors, the first Lord of the Admiralty and the secretaries to the Board and the Admiralty. Things changed again when, under the influence of Joseph Banks, the Board was reorganized. It had already become concerned with all navigational issues, not just longitude, and now the ambition was to become a scientific advisory board to the Admiralty. The 1818 Longitude Act appointed three Fellows of the Royal Society and three salaried Resident Commissioners on top of the professors. This was, apart from packing the Board with Banksian sympathisers, a way to include other scientific fields. I can’t comment on the internal politics but, despite obvious differences, there are some interesting similarities between the Board and the Longitude Committee. Firstly, of course, there is Lord Rees, who as Astronomer Royal links the two groups. (A few years ago, Rees had positions that would have earned him a seat on the Board of Longitude three times over: Astronomer Royal, President of the Royal Society and Plumian Professor). Oxbridgian scientific gravitas remains, with Athene Donald, Professor of Experimental Physics at Cambridge, and Kay Davies, Dr Lee’s Professor of Anatomy at Oxford. Also present is is Wendy Hall, Professor of Computer Science at Southampton. The range of disciplines shows that, while longitude was seen as a mathematical and astronomical matter, the breadth of potential challenges this time around requires a broader mix. The presence of women also reveals social change, although at 4/18 of the Committee, perhaps less than we’d like. Engineering had no academic or institutional presence in the early 18th century, but in the 21st it is clearly a field relevant to solving technical problems. Thus, rather than the President of the Royal Society, we haveMartyn Thomas, Vice-President of the Royal Academy of Engineering. A novelty of the last century is the appointment of scientists directly to government. On the Committee are Chief Scientific Advisor Mark Walport, Chief Medical Officer Sally Davies and David Mackay, Regius Professor in Engineering at Cambridge and Chief Scientific Advisor to the DECC. Otherwise, the connection to government is down to John O’Reilly, Director General of Knowledge and Innovation (there’s a title!) at BIS. From here the differences are significant, starting with those linking business, charity and government. 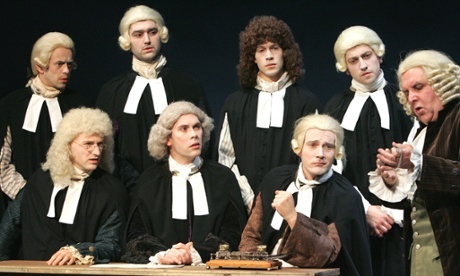 In 1714, men who made their living through trade would not, unlike the propertied gentlemen MPs, have been seen as disinterested enough to guarantee their trustworthiness. In 2014, however, we have David Gibson, Head of Innovation at GlaxoSmithKline; Andrew Dunnett, Director of the Vodafone Foundation;Iain Gray of the Technology Strategy Board; and Geoff Mulgan, Chief Executive of the prize organisers Nesta. Also included are individuals known for championing and communicating science. There is Imran Khan, Chief Executive of the British Science Association; Roger Highfield, journalist and Director of External Affairs at the Science Museum; and Andrew Cohen, Head of the BBC Science Unit. Spanning different ends of science and technology publishing arePhil Campbell, Editor in Chief of Nature, and David Rowan, editor of Wired Magazine. While 18th-century Britain had many significant popularisers of science, they would not have been Board members. Plenty was said about providing something of public utility, not to mention saving lives at sea, but there was no interest in consulting more widely. Indeed, it seems that the call for longitude rewards came from the scientific community – potential winners of money – rather than from mariners. The role of the public has, therefore, changed. While in 1714 an interested public was the source of potential solutions, with the large reward of £20,000 designed to spread the word and catch the eye, in 2014 there is little sense that answers will come from outside a trained and professional group of scientists or engineers. Thus the public is brought on board to help (a little) with a choice from the six potential challenges. What the result of the public choice is, and the response to the challenge, time will tell. Given that, unlike the original Commissioners of Longitude, the Longitude Committee has not been appointed ex officio, we might assume they hope it will all take less than half a century. Cross-posted from The H Word blog, where this post first appeared on 12 September 2013. This evening, the Astronomer Royal, Lord Rees, will weigh into the debate about climate change and geoengineering in an address at the British Science Festival. Finding such fixes, as well as more efficient forms of alternative energy, may well be problems focused on by the new challenge prize that Rees has helped set up. That he, as Astronomer Royal, will be judging what has been called a new ‘Longitude Prize’, seems appropriate, but the innovations under consideration may be a long way from his own field of astronomy and cosmology. Today the post of Astronomer Royal is honorary. It means simply, as Alok Jha’s article on Rees’s speech suggests, that he is “one of Britain’s most senior scientists”. Like a Chief Scientific Advisor, or the head of a scientific society, the Astronomer Royal can be expected to give all sorts of opinions about science and science policy, straying at least occasionally, if they wish, well beyond their area of research. Was it always like this? Yes and no. Until the 1970s the post of Astronomer Royal was synonymous with director of the Greenwich Observatory (at Greenwich, Herstmonceux and then Cambridge). Before the 19th century, the AR was also an active observer, in fact only one of two observers in the institution. Nevertheless, Astronomers Royal were often called upon to make judgements and offer advice in areas that did not relate to making observations or managing an observatory. Because the Royal Observatory was funded by government, being under the administration of first the Board of Ordnance and then the Admiralty, there was potential for them to be asked to consider a whole range of technical and scientific issues. For much of the AR’s history, the most obvious place in which this happened was the Board of Longitude. While many of the ideas under consideration were astronomical (involving knowledge of astronomical theory, mathematics, optics and instrumentation), others were based on geomagnetism or, of course, horology. Understanding clocks and timekeeping was essential to astronomy, but the specifics of horological theory and manufacture would have been beyond the AR’s experience. ARs also advised on areas like cartography, instrument design and weights and measures, that involved techniques closely allied to astronomy. But they were also asked to consider a wide range of fields of interest to the Admiralty and other branches of government, simply because they ended up being their available scientific expert. One of the ARs who most obviously became the government’s go-to scientific and technical guy was George Airy, who was in position from 1835 to 1881. Airy covered a great deal of ground, intellectually and practically. Unlike all his predecessors he was not much involved with daily observations and he had a significantly larger workforce at the Observatory, onto which observation, calculation and even management could be delegated. Airy, for example, did a considerable amount of work on the effect of iron ships’ hulls on compass use and design. He also advised, like many other ARs, on education and he was involved in the organisation of the Great Exhibition. He was, perhaps most intriguingly, called in to advise the Great Western Railway on track gauges and the engineer Thomas Bouch about the pressures that might be exerted by wind on the planned rail bridge crossing the Forth. That latter advice got him into trouble. 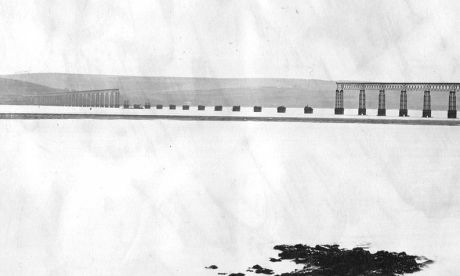 It was first applied by Bouch to the Tay Bridge and, when that collapsed in 1879 [see image above], Airy was called in by the enquiry. He claimed that his advice had been specific to the circumstances of the Forth and the design for that bridge (which was now speedily discarded). The enquiry agreed, suggesting that Bouch had “must have misunderstood the nature of [Airy’s] report”. Airy did know quite a lot about engineering. He was, apart from anything else, closely involved with the design of large instruments and their mounts at Greenwich. Times and the nature and range of expertise have changed considerably since the 19th century, however. Lord Rees is not an Astronomer Royal who can offer specific or technical engineering expertise, rather he is calling for research and funding. Whether or not you agree with his statements is a different matter. 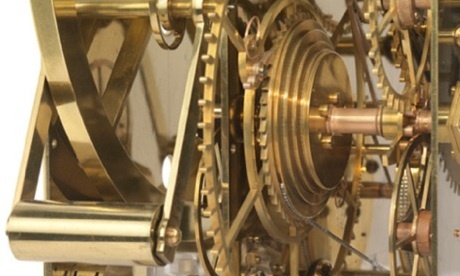 Will David Cameron’s ‘Longitude Prize’ for innovation achieve its aim? Cross-posted from The H Word blog, where this post first appeared on 14 June 2013. Today we will hear from the prime minister, David Cameron, about the launch of a new “Longitude Prize”. The £1m top prize is, he will say, intended to help the search “for the next penicillin, aeroplane or world wide web”, according to the BBC report. Lord Rees, the current Astronomer Royal, will head a “Longitude Committee” to judge ideas. It seems likely that, as we hear more about the design of the competition, the foci of the scheme will be narrowed and, I hope, that some ongoing means of aiding potential competitors will be brought in. We, and they, should recall that the original Longitude Prize was focused on one very specific problem with a number of understood technical challenges. In addition, as I have written elsewhere, John Harrison’s timekeepers would not have been produced without long-term financial investment. A prize is not enough. Nevertheless, the public face of this project is interesting so far for its hugely wide range. Part of the competition seems to be coming up with a good challenge: what is it we actually want to have solved? Cameron will be asking, “What is the biggest challenge the world faces in the coming years, and how do we solve it?”. The other key theme, of course, is the very obvious connection with the longitude story. The timing of the prize coincides with the tercentenary of the first Longitude Act next year. I assume that Cameron and Rees would like to have their problem defined and perhaps solved rather quicker that the century it took for the astronomical and timekeeping longitude solutions to become “practicable and useful at sea” – the demand of the 1714 Act. As I have written elsewhere, though, there was no such thing as the Longitude Prize, and the Longitude Act may actually have had very little effect in speeding up the process of innovation. The history of longitude suggests that new ideas and technologies depend on communities of educated and/or skilled people, on the ability to share and discuss ideas, the possibility of making use of others’ skills and sufficient time and funding for research and development. New products either need a ready market or they must be supported and subsidised. Nevertheless, as one of the team researching the history of the Board of Longitude, I am fascinated by the notion that a new Longitude Committee will be formed. Having the Astronomer Royal on board is entirely appropriate. All the Astronomers Royal between the 1714 Act and the closure of the Board in 1828 were key individuals for longitude projects to approach. All were ex officio Commissioners of Longitude and some, most especially Nevil Maskelyne, were essential drivers for all the Board’s activity. For most of the Board of Longitude’s existence the most active members beyond the Astronomer Royal were the President of the Royal Society, the Oxbridge (later also London) professors of astronomy and mathematics, the First Lord and Secretaries of the Admiralty. Late in its life, after the penultimate in a long line of additional Longitude Acts was passed in 1818, there was an attempt to transform the Board into a scientific advisory committee, including paid positions for six advisers, three of whom were chosen from among the Fellows of the Royal Society. For more technical and practical knowledge, expert instrument makers and practical seamen might also be called as committee members or witnesses. Who, apart from Lord Rees, will be included in the new committee? And what might a comparison of the Board then with the Committee today tell us about where authority and expertise – or good PR – rest today? Advising government: did Isaac Newton get it wrong? Just as today, governments past took advice about science. Isaac Newton gave evidence on solving the longitude problem. Was his advice as counter-productive as many have said? There have been a lot of posts lately in the Guardian Science blogs about the role of the new chief scientific adviser, Mark Walport. While finding myself in the novel position of attempting to offer some thoughts to this incoming chief, I have also been co-writing a book about the search for longitude at sea, much of which revolves around issues of the relationships between skill, expertise, government and the public. It turns out, of course, that advisers to government have often drawn flack, usually from those who stood to lose out financially as a result of their advice. Sometimes, though, that criticism comes as a result of hindsight. Given posterity’s tendency to condescend, that criticism is not always fair. 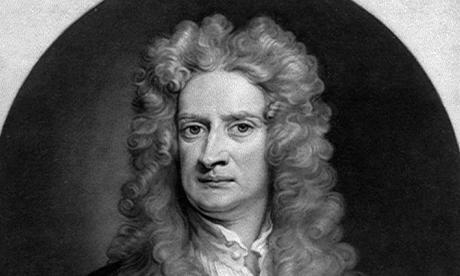 When the first Longitude Act was passed in 1714, the Walport equivalent was Isaac Newton. Although most often thought of as a solitary genius with apples falling on his head in Lincolnshire or writing an incomprehensible but revolutionary book in Cambridge, Newton was also to be an MP, Master of the Mint, President of the Royal Society and adviser to government. When parliament considered a petition that asked for rewards to be offered to those who could help solve the problem of finding longitude at sea, Newton’s evidence was very clearly incorporated into the Act as written. As, thereafter, an ex officio Commissioner of Longitude, Newton also became one of those who judged submitted ideas and advised on whether they might be worth supporting. It has become common to blame Newton for deflecting the commissioners and British government from what has been judged as the “correct” path to a successful outcome. It has been suggested that Newton was naturally biased to favour astronomical solutions and had little time for or interest in clocks as the way forward. It seems clear that Newton did think that astronomical methods would – at some point – provide a successful solution. He believed that his evidence about their potential accuracy was reflected in the several levels of reward offered in the 1714 Act. In addition, the fact that the Act indicates that a reward might be payable after a single successful trial may show an assumption that the answer would lie in something universally applicable, like astronomy, rather than a machine. Usually seen as most damning is the fact that Newton stated several times that longitude was not to be found by clockwork. He also suggested that clocks put forward for reward should be examined and trialled by others before the commissioners need meet to consider them. His deprecation of clocks may have helped later to delay the acceptance of Harrison’s chronometers [sic], which did in fact offer a practical determination of longitude at sea. Leaving aside the fact that Harrison’s unique watch left the British public a long way from possessing a practical solution, is it fair to say that Newton was prejudiced against clocks and retarded the putting of government funds into this method? Nope. Not really. Firstly, Newton was dead right that longitude “is not to be found by Clockwork alone”, so long as astronomical methods were the only way of checking that an on-board clock was behaving itself. * As he said, a clock might be able to keep track of longitude but, should the clock stop or become erratic, only astronomy could help find longitude again. This essentially remained true until wireless radio signals could be used to compare a ship’s local time (determined astronomically) with a broadcast reference time. Newton was also not so prejudiced against clocks that he did not wish to be bothered by applications from their makers, or at least no more than he was by any other such applications. In the case of astronomical methods, too, he advised that they be examined by other experts before being presented to the commissioners. We also know that, several years earlier, Newton had been interested in Henry Sully‘s ideas for making a longitude timekeeper – something he went on to do in the 1720s – and had encouraged him, even passing on information about another horological novelty that he had come across. Newton certainly could be wrong – I am sure that everyone can think of a few examples – but not really about this. * The difference in longitude between two places is equivalent to the difference in local time. Did the Longitude Act speed up the solution to the longitude problem? Cross-posted from The Longitude Project Blog. I recently did a brief talk for some of the staff at Nesta, including their Centre for Challenge Prizes, on our project and outcomes of our research. During the discussion, someone asked what is, particularly for them, a very pertinent question: “Did the Longitude Act speed up the arrival of a solution?”. My answer was something along the lines of “sort of, possibly, probably no…”. It is not the kind of question that we historians are necessarily very good at answering, involving as it does the counter-factual world in which no such Act was ever passed by the British parliament. Still, it’s an interesting idea to play around with. All the things that first came to my mind were the reasons why it didn’t make the blindest bit of difference. For a start, it was not the only potential reward available for whoever should come up with a viable longitude solution. As well as the earlier Spanish reward system, the Dutch version was still on-going, as were prizes on offer from the French Académie des Sciences. Had there not been the 1714 Act in Britain there might have been another one or initiatives organised through private individuals or institutions like the Royal Society. Even without these schemes, plausible navigation-related ideas were always a potential means of gaining patronage and, if successful, could lead to honours, rewards, customers and a viable business. While the Longitude Act held out the possibility of a very large reward, it was certainly not the only or – for most people – the most likely way to make new ideas around longitude pay. The question of “speed” is an interesting one. It is impossible to predict how long new ideas should take to develop, but when we consider that it is two decades before the Commissioners of Longitude met as a group, and another three before serious money was dispensed, it doesn’t sound particularly speedy. The 1714 Act had looked for a “practicable and useful” solution for the public, but there wasn’t anything widely available until a century later. Something else that disrupts the idea of a prize having a quick and direct impact is the very international and collaborative nature of the potential solutions. The astronomical knowledge and mathematical tools required to make the lunar distance method workable were the product of many minds, in several countries. It was a process that might have been sped up by much larger sums of money being thrown at observatories to employ many more astronomers, but probably not by the possibility of a future prize. The timekeeping method was also more international and collaborative than is often remembered. While a single clock can seem obviously the work of an individual, it incorporates the skills of many piece-workers and collaborators, knowledge of predecessors and availability of particular materials. These things are specific to time and place, meaning that new technologies only become possible in those circumstances. If the time was ripe for Harrison, so too was it for Ferdinand Berthoud and Pierre Le Roy in Paris and (possibly, or in time) for Thomas Mudge, Larcum Kendall and John Arnold in London. However, it is certainly true that the Longitude Act gained lots of attention and provoked lots of interest. It would also seem that the key players in the story – like John Harrison, John Hadley and Tobias Mayer – were, it not directly inspired to look at the problem as a result of the Act, certainly quickly interested in making contact with the Commissioners. Over time, their work was also to become of greater public interest and, therefore, better known as a result of the fame of the Act and all those involved in it. It is probably also fair to say that Harrison would not have had the time or money to dedicate so much of his life to the problem without the financial assistance of the Board. I would also argue that investment in the later 18th century in the two methods – through the Nautical Almanac and other publications, trials, further rewards, training and so on – probably did speed up or at least allow their wider adoption. This, however, was only through new Acts and a changing understanding of the Board’s purpose. All in all, my view is that had the 1714 Act, Harrison, Hadley and Mayer not existed, others would very probably have (and sometimes did) come up with similar solutions to the problems they tackled within somewhere around the same time frame. However, this is not necessarily a conclusion that I would claim for the progress of all reward schemes and challenge prizes. Things would be different should a prize, for example, highlight an issue people were unlikely otherwise to be working on or in a period with a much larger and more professionalised workforce than in the 18th century. But that is only my view and, like all counter-factuals, probably begs to be shot down. I’d love to know what others think. By Rebekah Higgitt and James Wilsdon and first posted at The H Word blog. It is an edited version of their contribution to the book Future Directions for Scientific Advice in Whitehall, which is free to download here. It is easy to chant the mantras of evidence-based policy, but less straightforward to determine which forms of expertise and evidence should count. There is now a welcome recognition across government that many policy problems benefit from multidisciplinary perspectives. But implicit hierarchies between disciplines persist, which are rarely explained or written down. There have been several efforts to demonstrate the value of the humanities to policy in recent years, including helpful contributions from the British Academy, the Arts and Humanities Research Council and individual humanities scholars. Some progress has been made, but as the historian Roger Kain put it in his October 2011 oral evidence to the House of Lords inquiry into chief scientific advisers (speaking on behalf of the British Academy): “The term science and engineering seems at the moment to not exclude but marginalise the humanities and social science in relation to advice and expertise: culture, history, language, psychology, and political science”. The potential contribution of a number of “marginalised” disciplines merits discussion. Here we want to focus on history, and call for the evidence and expertise of historians to be taken more seriously in policy – particularly science policy – alongside evidence from the natural and social sciences. Given Sir Mark Walport’s support for the medical humanities and the history of science during his decade as director of the Wellcome Trust, we hope this is an agenda where he will want to demonstrate some leadership during his tenure as government chief scientific adviser. We suggest that one way he could signal his commitment to the value of historical methods and insights in science policy would be to pilot a “hindsight project” within the government’s existing Foresight Programme. In science policy, history often plays a role as example or justification, based on assumptions about how science is done or how innovation occurs that misrepresent our knowledge of the past. As Virgina Berridge notes in her study of history in health policy, there can be a “totemic role” for historians, where historical messages are “misunderstood or used for particular policy purposes”. Historians, naturally, aim to mediate the history used in the public sphere, ensuring that is not completely divorced from their research, most of which is publicly funded. Initiatives like History and Policy are focused on encouraging historians to see the potential relevance of their work and, through policy-friendly reports, aim to show that “historians can shed light on the causes of current problems and even suggest innovative solutions”. Historians have occasionally found a role within policymaking through research focused on topics of recent history and obvious relevance. One example is Catherine Haddon who, having produced a thesis on Whitehall and cold war defence, is now a research fellow at the Institute for Government. Similarly, there was interest in historian Abigail Wood’s work on foot and mouth disease, in the immediate aftermath of the crisis of 2001. His timing was deliberate: with momentum building around the use of evidence in policy and new initiatives such as the Cabinet Office’s network of “what works” centres, historians feel they are in danger of being undervalued as an asset to the policy process. History of science can provide insights that may have general agreement within the discipline but sharper divergence from more popular accounts. Historians are good at judging the interests that lie behind differing interpretations of the past, as well as exploring their validity. One example is the work of David Edgerton, who has highlighted a number of areas in which common assumptions in science policy are shown to be problematic. These include challenging the perceived economic and technological significance of publicly funded research, and cherished notions of researcher autonomy such as the “Haldane Principle”. Although Edgerton has shown that the so-called “linear model” of innovation is a recent academic construct, created as a foil to better models, there is frequent recourse, both by science lobbyists and austerity-juggling politicians, to economic arguments for science funding that sound suspiciously similar. The argument that pure scientific research is the best means of producing new and unexpected technologies dates back to the 19th century and has been corralled into support for increased state funding of science ever since. Historical research has, however, shown that what is classed as “pure” science can often be seen as the product of work focused either on specific outcomes, or existing within what Jon Agar has called “working worlds” or “projects that generate problems”. Historical myths, assumptions and analogies frequently find their way into policy announcements and, even if merely as throwaway devices to help frame a speech, can by repetition serve to cloud important issues. One example is the persistent myth of Britain being good at discovery and poor at supporting innovation, referred to in a 2010 speech by David Willetts, the minister for universities and science, as “that old British problem of failing to make the most of our own discoveries and inventions”. James Sumner pointed out that his example – Joseph Priestley, Johann Jacob Schweppe and the production of carbonated drinks – completely undermined Willetts’s point. One opportunity for the input of historical expertise to discussions about science, technology and innovation is in the recently established Centre for Challenge Prizes within Nesta, the UK innovation foundations. As the Centre’s Landscape Review explains, one of its activities will be research into the effectiveness of challenge prizes, past and present. The emblematic example of challenge prizes is the 1714 Longitude Act. The meaning and usefulness of this choice is something that a current AHRC-funded research project on the history of the Board of Longitude, based at the University of Cambridge and the National Maritime Museum, is well-placed to examine. While the well-known version of the story appears to back claims about the efficacy of one-off inducement prizes, research shows that in order to provide a practical solution to the problem of finding longitude at sea, the Board was necessarily much more flexible in the range of funding mechanisms they used. Given the focus on challenge prizes as economically efficient, perhaps the most problematic claim is that they “generate commercial activity”. It was the already-thriving commercial activity surrounding instrument making in 18th-century London that enabled production of potential longitude solutions, rather than the large reward acting as an incentive to commerce. Where the Board of Longitude was particularly significant was not in a one-off reward but through long-term support, as the longitude solutions were gradually accepted, embedded and made commercially viable. The idea that financial risk can be limited “by awarding a prize only when the challenge is successfully met” raises pertinent questions, which troubled the Board greatly, about how to judge success. As well as paying out smaller rewards for promising ideas, the Board paid Harrison a very large reward despite the fact that his single, expensive and complex product was a long way from solving the problem for every naval vessel. The lessons to be learned are that prize criteria must be drawn up with extreme caution, and organisers must be clear about how much money is worth risking on a potentially prize-winning but not problem-solving solution. The longitude case is one in which the history is partially known, in ways that are informed by erroneous assumptions about the nature of innovation. Familiar stories of geniuses who work alone to produce products that solve problems, more or less at a stroke, could hardly be less useful. Harrison was remarkable, but he and the successful longitude solutions required the skills of others and long-term support. Similar stories can be unearthed about other, more recent examples of challenge prizes and should be incorporated into thinking about what can be expected from such initiatives. Of course, historians are not likely to be welcomed to the party if their only contribution is “but it’s more complicated than that.” An ability to unpack assumptions, myths and the lost contexts in which particular policy ideas were formed can be particularly useful. Dealing with nuance and complexity in evidence, and how perspective changes its interpretation, are commonplace skills in historical research and could be invaluable for mitigating potential policy failures and controversies, for example around new and emerging technologies. As Geoff Mulgan has argued in this series of posts, historians and political scientists have also made important contributions to the field of “evidence about evidence”, helping policymakers to understand how knowledge is formed, exchanged and used in policymaking. All of this leads to our modest concluding proposal. As Sir Mark Walport takes over at the Government Office for Science, one small but significant way in which he could signal his commitment to the value of historical methods and insights would be to pilot a “hindsight project” within the existing Foresight Programme. Adding one or two historians of science to the policy mix could provide the Government Office for Science, and the wider science and engineering profession in Whitehall, with the “rear mirror” on which, as Lord Butler argues, every good driver should rely.